Damn, that dude could survive a nucular war! I would be leaving in about seven hours. Flat on my back with the crossover drive chain inking grease tracks across my neck, I felt the itch in my lachrymal ducts and the tension in my chest. Whether it was the music, the totality of change, Elisse, fear, exhaustion, or the impossible amount of work yet to be done, I don’t know. All six, probably. But whatever it was, it hit me and it hit hard. Growing up an American male makes it hard to let loose a tear, but cry I did, softly and with feeling. It was refreshing and poignant, and when Alexis Weissenberg brought the slow movement to a close with an expressiveness bordering on the profound, I blinked, laughed out loud, and looked up at the monster parked above me. Blue. It was eight feet long, shining, and very blue — and it was draped with wires, a good many of which had yet to be zip-tied to the frame. I lay and stared up at four months of work and thousands of dollars: a bizarre machine created for one purpose alone. 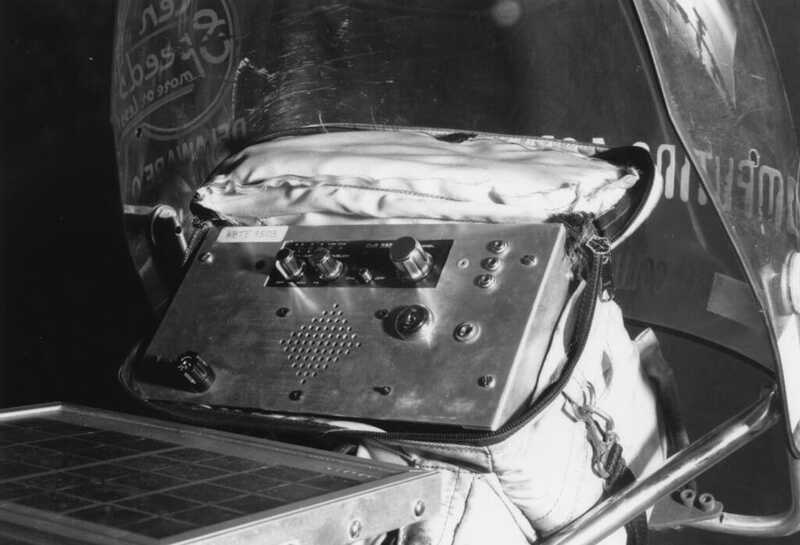 A brushed-aluminum box under the seat housed a control panel for the lights — a neat array of miniature toggle switches. I flipped one and the seven-inch yellow barricade flasher sprang to life; I flipped another and a xenon strobe atop the flagpole began flashing. I switched on the headlight, which blazed against the far wall, and then the taillight, suffusing the room in a red glow. The bike looked like an airport. I finished the wiring and slid awkwardly out from underneath. Fatigue was wearing on me; I felt bleary and disoriented. The thought of actually riding the thing was abstract — surely this was just a weird custom engineering job on the eve of deadline. It looked like another all-nighter ahead, the third in a row but for a few confusing short naps. I gazed at the pile of packs on the floor and groaned. More coffee. I need more coffee. Sipping the steamy black liquid from a cup I’d known for years, listening now to John Mayall’s sensual Turning Point album, I sat and regarded the bike. Thrust into my comfortable space, incongruous among the books, tattered furniture, and my old Hammarlund shortwave receiver, there gleamed something extraterrestrial in appearance. Is this real? I stared at it, almost puzzled. On this I was about to set off across the United States? This fragile, curious contraption was about to become my home? Too strange. Much too strange. I’d better get used to being stared at. A 5-watt array of Solarex photovoltaic panels, tilted on its ball and socket mount, sparkled blue in the overhead lights and possibly even generated a trickle of current right there in the living room. Above the sixteen-inch front wheel, a clear plastic fairing (to break the wind) was emblazoned with COMPUTING ACROSS AMERICA in red, white, and blue lettering; just behind it, a bright aluminum electronics package bristled with the controls and indicators of the CB, security system, and power-control circuitry. Bike Tech: The rear hub is a double-threaded Phil Wood tandem unit with 48 holes. 14-gauge DT stainless spokes connect it to the Weinmann concave alloy rim in a cross-4 symmetrical undished pattern, which differs from the normal bicycle rear wheel that is flatter on one side to make room for the gear cluster. I can recommend this highly… over the years my 48-spoke wheels have taken 17,000 miles of heavy abuse without ever breaking a spoke — except for one accident involving a truck, where spokes were the least of my worries. Beneath the seat were the handlebars. Shift levers for the eighteen-speed wide-range gearing system protruded from the ends; handbrakes and a few other random controls were mounted within easy reach. A digital speed and distance display called the Push was perched on the top tube between my legs, and three velcro-wrapped water bottles were affixed to the frame. The rear wheel, itself a unique piece of bicycle engineering, gleamed unnaturally with its forty-eight spokes and drum brake. Behind the seat and extending two inches from either side was a piece of PVC sewer pipe with reflectorized end caps: a waterproof case for my atlas. I was sprawled on the couch, holding the empty cup and staring at the machine in a sort of marveling fog, when the doorbell rang. Huh? It was almost 3 a.m.
That was exactly what I needed. I leapt up, welcomed my friend heartily, and started messing with the packs. “Have you ridden it yet?” Frank asked. Frank clomped down to the basement and returned a few minutes later with two gallons of synthetic motor oil, a carton of milk, some two-by-four scraps, and a fire extinguisher. He dumped it all on the floor with a grunt, picked up the Cannondale panniers, and snapped them onto the rack. We wrestled the bike outside and I climbed on for the first test ride, less than six hours away from a departure ceremony that would be attended by over two hundred people and filmed by three television stations. Frank straddled his Motobecane and waited patiently for me to fumble with my toe clips. And we were off. My lighting system dwarfed the little generator light on his bike — I looked more like a motorcycle wavering down the road than a bicycle. Everything about the machine was unfamiliar and I missed a few shifts, but it felt good by God, it felt damned good, and before long I was sailing along in the darkness, flashers reflecting eerily from the houses, high on that strange energy that comes from being out and about while the rest of the world sleeps. Normally busy intersections were vacant, and I flew through a red light at 21 mph without a thought to the ever-vigilant Dublin police. What a machine! I pushed back hard against the webbed Dacron seat, sensing the efficiency of this design. The difference was much more than mere comfort — thanks to full back support, my power to the pedals was not limited by body weight. Frank shrunk to a flicker in my helmet mirror as I sprinted ahead, hot and invincible, ready to take on America… all of it. The bike felt compact and smooth. My arms hung relaxed at my sides, hands resting lightly on the handlebars. In this seated position I had an unprecedented sense of being in control: I could see the world without putting a crick in my neck, and there was a reassuring feeling that in an accident I would land on my feet instead of my head. “No, I pedal it. See?” I backpedaled, the new SunTour freewheel singing crisp clicks like a hazy childhood memory of summer locusts. We moved on, pausing while I practiced a few wobbling figure-eights in the parking lot. I was about to be filmed riding this strange machine, and I didn’t want to fall over on the evening news. Such delicious insanity! This seemed more like a prank than the beginning of a new life, but by the time we made it back to my house I was ready to hit the road and pedal forever. Unfortunately, I was still loaded with milk, oil, lumber, and books instead of tent, clothes, tools, and computer. Somehow, I got it packed. My last memory of that night is a cartoon image of an impossibly heavy recumbent, seeming to sag under the load. It was ludicrous, insane. 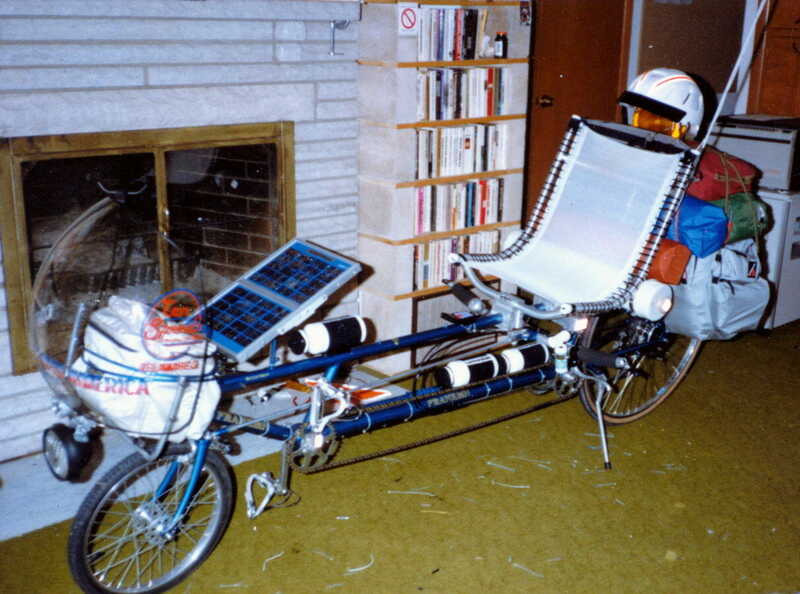 I sat on my new home for a while and tried to imagine pedaling across the United States. I reached behind the seat and pulled out my virgin atlas. The country looked huge. I rang the handlebar bell and went to bed.